But something did not feel right. My thought process seemed counterintuitive and it was forcing some difficult conversations between my wife and I. Was this the American dream? Constantly worrying about saving more AND spending less? Pretty sure we were Dave Ramsey's model students... but something still didn't settle well with me. How were we supposed to keep this up with every new baby and/or expense we had? We were hoping to have three children someday. As a result, our various discussions about finances started making the future look more and more stressful. Anxiety started setting in. I saw the book, Rich Dad Poor Dad, in my Audible "Recommended for you" and I had a 13-hour drive from Pensacola, FL to New River, NC after graduating Naval Flight School. Over the next several hours in my Automobile University, my world was turned upside down. What I learned changed how I thought about every financial decision from that point forward. Gone were the days where I would save money for the sake of compound interest and wait until I turned 59.5 or 65 to spend any of it. I wanted my life to be better NOW! Or at least within the next several years. Moreover, I wanted my life to continue getting better every month and every year. It wasn't the money I wanted; instead, it was financial freedom. Before you make any assumptions, the book was not a get rich quick scheme. In fact, it was a book about patience more than anything. Patience with a strategy and a mindset focused on cash flow and assets rather than loans on liabilities. Rich Dad Poor Dad tells a story about a man with “two fathers:” his own and his best friend’s. His father has a 6-figure paycheck, a college degree, lives in a nice neighborhood, and has a 401k, but struggles month-to-month financially. The other father didn’t have a college degree, lived in a lesser neighborhood, and did not have a 401k retirement plan. Instead, this father focused on creating a small business and owning real estate. The kicker was, the father with the 6-figure paycheck was the "poor dad" in the book. The rich dad lived a relatively stress-free life in which he created systems to work for him, while the poor dad constantly found himself pouring over his receipts and family spending spreadsheets. The rich dad helped me realize, all I needed to do is get more paychecks. Paychecks that I didn't work for on a day-to-day basis. Most of us grow up focusing on how much we earn per hour. Constantly trading our precious time for money and striving valiantly to increase our hourly rate. In the military, it means doing everything we can to get to the next rank for a pay bump or waiting one more year to have our bi-monthly paycheck to increase by a sad ~2.5%. We keep trading our time for money even though time is the only thing we can't earn more of... we can always earn more money. Here is the question I felt the book asking me: what if you, Markian, spent your free time creating something that would continuously send you checks on a monthly basis. Imagine you want a new Mercedes C-Class. Traditional wisdom would say, "Get a higher paying job, or pay cash so you don't overspend on the interest rate." What if you just had two separate sources both earning you $250 paychecks ($500 total) each month without you doing extra work. And those sources just paid for your car expense. Have I beaten this concept to death at this point? Good. Rich Dad Poor Dad tattooed this concept onto my brain. The concept is what Real Estate Investors call Cashflow. Again, I realized that I DID NOT want to be rich when I was 65 if it cost me my lifestyle during my younger years... I would rather have a healthy amount of cash coming in every month from various sources and retire early. Or at least do WHATEVER I wanted after the military without having to consider the paycheck coming from my new hobby, project, or even job as part of the equation. That is financial freedom. Both terms "residual income" and "passive income" attempt to capture the same concept of, "making money automatically." For the sake of brevity, I will only be using both terms interchangeably. After hearing the words "passive income,", many of us immediately start having romantic visions of lounging on a yacht in the Caribbean Sea and occasionally checking our growing bank account. You quickly snap back into it, take a sip of your Monster Energy drink, and try to stay awake while on your 24-hour duty at the barracks. Is a blissful and passive lifestyle actually possible? Is it possible to plan out my military career to get closer to such a lifestyle? Yes to both... Keep reading. Allow me to let you in on the secret of generating "residual income." Secret: Acquiring money making systems... also known as assets. An asset is something that puts money in your pocket every month. It is a lifestyle and wealth multiplier. A liability is something that takes money away from you every month. It might be a temporary lifestyle enhancer, but a long-term lifestyle and wealth killer. Rental Properties are the best assets in America. Period. Educate yourself to the point that you can find and buy American Real Estate that you rents at a higher price that all of its expenses and there is still a significant amount left over. The leftover cash is that stream of income or cash flow. Finally, when we start looking at these income streams collectively, it becomes known as "residual income." Admittedly, setting up your own Real Estate Investing Business is NOT easy... however, with the proper education, Real Estate Investing does NOT have to be difficult. But you must learn and act. Now, if you all of the above makes sense, a funny thing will start happening. When you start talking to people about finances you will soon begin to realize that there are two different kinds of people in this world: those that understand the difference between an asset and a liability, and those that will NEVER be wealthy. If I make an iPhone app that costs $1 and every month 1000 people purchase it, that app is an asset. If I purchase a rental property that rents out for double it's expenses, that property is an asset. Each of those entities are money making systems. They produce income while costing very minimal personal effort or time. Even if one of those ended up costing me a million dollars a month but produced two million dollars a month, it is an asset. Honestly, who cares how much you are spending on an asset every month if it earns you more than what you spend? Now let's take it one step further... what if the spending was automatic and so was the earning? If there was a machine that spit out two dollar bills after you gave it a single dollar bill, you would be glued to that machine all day! Moreover, you wouldn't care if that machine charged you 50% interest on your dollar before generating you the two dollars it spit out. Hell, you would probably do your very best to figure out how to make more of those machines. But, alas, I have a love/hate relationship with the term "passive income." Because passive income inherently means that I do not have to spend the most expensive thing in life, time, in order to earn a certain amount of residual income. Because some people that hear the term get disappointed when they realize there is a lot of education and some significant set up required on the front end of their journey to financial freedom (our "Why"). Again, this isn't a get rich quick scheme, but it is a hell of a lot better than what I was taught by some of my military and veteran mentors. 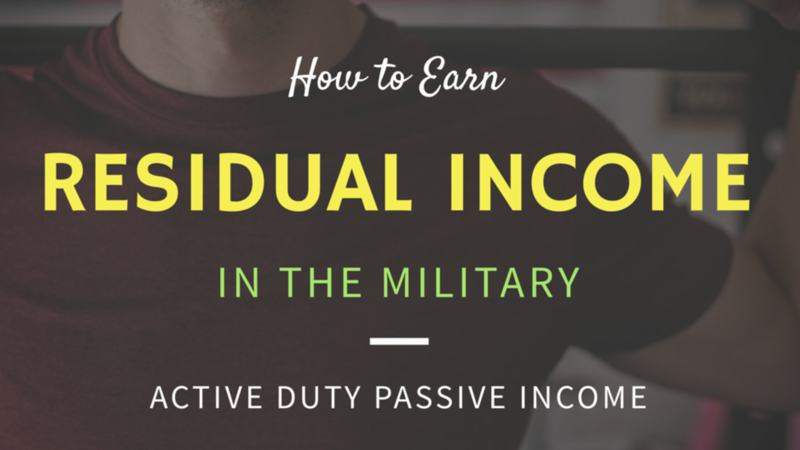 As members of the military, we often believe it would be very difficult, or maybe even impossible, for us to find time to earn extra income. As far as our professional priorities, our military service should be at the very top. So how can we ensure that we are setting our new real estate investing business up for massive success? How do we make sure it doesn't create more stress than pleasure? Is possible to be a successful active duty real estate investor? The trick is to leverage our VA benefits, minimize our personal housing expenses, and focus all of our savings towards producing assets... a.k.a. rental properties. 1) VA Loan Mastery Course. 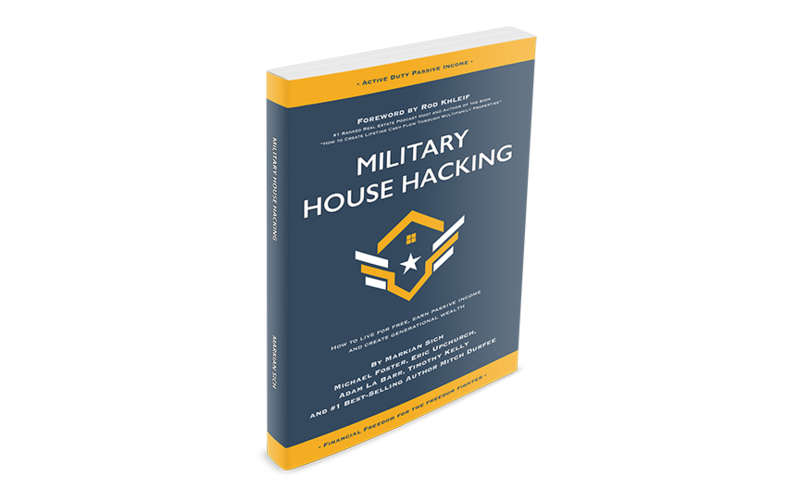 2) The Military House Hacking eBook. 3) Our animated video on blending primary residences and Turn-Key rental properties to achieve $10,000 a month towards your own residual income model. 4) If you want to see your potential cash flow and equity years down the road, check out our free REI Cashflow Calculator, or what we like to call The New Military Retirement Calculator. If you want to fast track your education and start closing on properties, I highly recommend checking out our Military Real Estate Investing Academy. We focus on the tips, tricks, and strategies, that are most profitable and passive for members of the military. Owning your own Military Realestate Investing business is much more realistic than most think. Remember, "You're only one deal away," from changing your mindset and your financial future!